The goal of the Natural Resource Education Program is to provide quality education/information to Washakie County residents that promotes a knowledge and appreciation of the conservation of natural resources, and of our local resource base, by utilizing a "hands-on" and interactive leaning approach. We would love to take your students beyond the walls of a traditional classroom and spark their interest in the world around us. We can also come to your classroom and teach or provide you with resources to utilize yourself. We have rubber animal tracks, rock and mineral collections, games, and more. 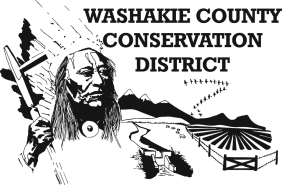 The Washakie County Conservation District offers many engaging activities for local schools. We can help bring the great outdoors into your classroom with activities such as the Enviroscape, an interactive model of a watershed and how pollutants can enter our stream systems. 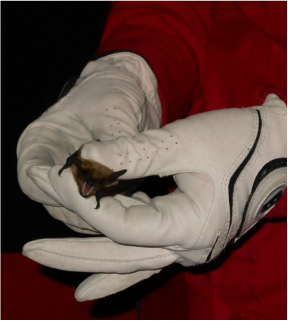 All of our conservation lessons are aimed at supporting Wyoming teaching standards. WCCD assists area teachers with a number of field trips from learning about wildlife habitat to collecting rock samples. Visiting local farms to learn about irrigation systems and water conservation puts the students in contact with area producers and connects the food they eat to the place it is grown. Field studies on area ranches help the students learn the connection between the rancher and the natural resource. ​An outdoor adventure may include a field trip to The Nature Conservancy's Ten Sleep Preserve to learn all about trees; from the story of a tree ring to the role of fire in the forest. Another may include an autumn trip to an apple orchard where students explore habitats and also end the trip with a tasty treat! ​The District's Outdoor Classroom, which is located approximately 3 miles south of Worland, is also an excellent way to teach students about a wide variety of natural resource related subjects such as plants, soil, water, agriculture, and wildlife. This property is leased by the District from a local landowner for the purpose of providing area youth with a place to study natural resource topics, or practice their creative writing skills. ​Since 2002, WCCD has assisted the 6th grade classes with the International Day of Water Quality Monitoring. Each year, all of the 6th grade students from Worland Middle School and Ten Sleep School spend the day on a field trip to learn about the local landscape and conduct water quality monitoring. The students rotate through different subject centers where resource professionals teach them about, plants, wildlife, geology, aquatic insects, fire ecology, using global positioning units, fisheries, watershed health, collecting water quality data, and more. ​Soil and Water Stewardship Week celebration during the end of April each year. WCCD offers 2nd and 5th grade students the opportunity to participate by introducing a theme which is chosen by the National Association of Conservation District's. Students are taught the importance of natural resources related to the theme, then use their artistic abilities to create posters to convey the theme message. The local Grand Prize winners receive a cash prize and those posters are sent on to the state competition, then possibly the national level! 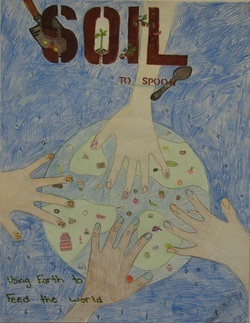 Pictured is the 5th grade Grand Prize poster.